If you have an Advanced HDPVR 630, you may have heard of “smart recording.” But what exactly is it? By using smart recording, your PVR will automatically look for the earliest airing of a program that matches your event criteria. So, if you’ve said that you only want to record new HD episodes of Elementary, your PVR will go through the listings and find the first scheduled showing of a new episode, in HD only. 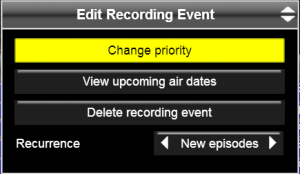 You can also set priority levels for each show that you set reoccurring recordings for, so when your PVR is scheduling its recordings, it will start with the highest priority shows first, and work its way down. This customisation ensures that exactly what you expect to see recorded will be waiting for you in your PVR list. 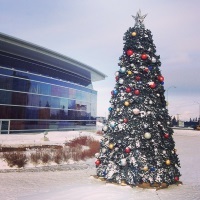 In the event of a recording conflict, your PVR will adjust to find a different time to record a show that is set to smart record in order to resolve the conflict. It’s like a referee for your TV. Creating smart recording events allows your PVR to have the maximum flexibility so it can work to record as much content as possible. 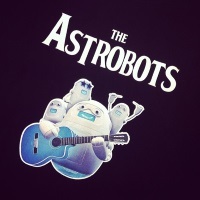 Recording conflicts will occur when there are more recordings scheduled than tuners available. The Advanced HDPVR 630 can record up to two programs at the same time as it has two available tuners. If there were three recordings scheduled manually through the guide at the same time, there will be a recording conflict and only two shows will wind up being recorded. By using smart recordings, the PVR will find an alternate time for the show with the lowest priority. How can you tell what has the lowest priority without customising this? As a rule, the PVR will choose the shows on the two lowest channel numbers. So, if you had manually scheduled recordings for shows on channels 12, 36, and 43, if you did not adjust the priority settings, the shows on channels 12 and 36 would be recorded. 1. Press the GUIDE button on your remote and find the program you would like to record. 2. Highlight the program in question, and press ENTER/OK. This will bring up the “Program Options” menu. 3. 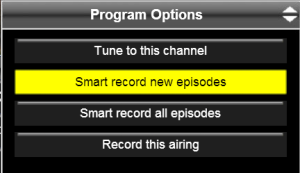 Press the DOWN arrow button and highlight either “Smart record new episodes” or “Smart record all episodes” and then press ENTER/OK. The recording will now schedule. If you are recording a show that is no longer being made, you would be best to record all episodes, whereas if you are recording a show that is still in production and have seen past episodes, it may be best to record new episodes. 1. Press EXIT to close the guide, and then press MENU. This will bring up a menu bar along the bottom of your screen. 2. Press the RIGHT arrow button and highlight “PVR.” Press ENTER/OK. 3. Press the RIGHT arrow button and highlight “Options,” then press ENTER/OK. This will take you into a list containing all of the programs that you have scheduled to record. 4. Find the one you would like to edit, highlight it by pressing either the UP or DOWN arrow button, and press ENTER/OK. This will bring up the “Edit Recording Event” menu. 5. From this menu, you can change the priority, delete the recording event, change the recording recurrence, select a channel you would like to record the program on, and more. Changing the priority will mark how important the show is to you in terms of scheduling (as discussed earlier). Recurrence changes between recording all episodes or new ones. If you have any questions about smart recordings, don’t hesitate to ask us! The new HD Guide is here!In "Equipment"
Using an External Hard Drive with your HDPVR 630In "Technical Tips"
Ordering Shaw Direct Pay Per ViewIn "How-To"
so the guide still reflects the wrong info for big brother after dark, how long does it take for this to be corrected. It still says its the episode from 2007 when it is the new one? What about when it records the first occurrence fine then decides to record a totally different show for the remainder of the series? This was happening all winter long on my 630. But only for selected shows on prime time. I just selected Smart Record The Series. No it happened to many different prime time shows. I have not done it recently because of reruns. I will try it on Under the Dome. Or another summer replacement. I could record CBS Sunday Morning and The Lang and O’Leary Exchange fine. 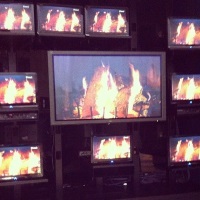 MY comments on the forum on Digital Home seems to indicate that this might just be my 630.